Prognostic factors are used to determine the subtype of a disease- how aggressive is the disease, what treatment will be most beneficial and probable recurrence of the disease. These prognostic factors range from a patient’s overall health to the presence of specific molecules found on the surface of CLL cells. The first attempts to capture the clinical differences of CLL patients led to the creation of clinical staging systems by Drs. Kanti Rai and Jacques-Louis Binet. These staging systems help physicians determine the status of a patient’s disease at the time of diagnosis. Staging is based on physical aspects like lymphadenopathy (enlarged lymph glands), splenomegaly (enlarged spleen), and hepatomegaly (enlarged liver) as well as the extent of anemia (result of low red blood cell count) and thrombocytopenia (reduced number of platelets) in the peripheral blood. In the United States the Rai staging system is used, ranging from Rai stage 0 (low-risk) to Rai stage 4 (high-risk). Binet classification is common in Europe. Patients are classified between Binet A (low-risk) and Binet C (high-risk). Patients with early stage CLL have an estimated median survival time of 10 to 15 years. However, the stage of the disease can change with disease progression. In addition to the staging systems, other factors must be considered to determine an accurate prognosis. Blood tests are important to determine how rapidly the CLL is progressing and when treatment is needed. There are many components of a complete blood count (CBC) that physicians look at to determine how the CLL is affecting the body. The doubling time of lymphocytes is a good indicator of the pace of the disease. If the lymphocytes double in a year or less, this is a significant indication that the disease is aggressive. Hemoglobin levels (a protein in red blood cells that transports oxygen from the lungs), red blood cell counts and platelet counts are monitored closely. Normal levels indicate that the CLL cells are not interfering too much with the normal activities of the body. Low levels are a sign of disease progression and an indication of the need for treatment. Additional blood tests help physicians understand the overall condition of the patient. Beta 2 microglobulin (B2M) is a very reliable prognostic factor that has been tested for years. The general consensus is that a B2M level of around 4 or less is a good signal of indolent disease, although B2M levels can change. Thymidine-kinase is also a common blood test used in Europe to evaluate CLL patients. A higher level of Thymidine-kinase in the blood constitutes a higher risk of aggressive disease. The search for additional prognostic factors has yielded important new information regarding the clinical behavior of CLL. Techniques such as fluorescence-in-situ-hybridization (FISH) have enabled researchers to detect abnormalities of certain chromosomes in CLL cells. FISH tests currently look at chromosomes 11, 12, 13 and 17 in CLL patients, although there are additional chromosomes related to CLL that are under investigation. In addition to providing prognostic information, these abnormalities also provide clues about the involvement of certain genes and biochemical pathways that are associated with the development of CLL. The mutation status of the IgVH gene is also an important prognostic factor tested in the blood. IgVH genes, found in the DNA of lymphocytes, are responsible for producing antibodies. A mutated IgVH gene is a good prognostic factor. The more mutated IgVH genes are, the more mature the genes are, making them more capable of protecting the body. CLL patients with mutated genes typically have a less aggressive course of disease and require treatment later than CLL patients whose lymphocytes contain unmutated genes. An unmutated IgVH gene is related to earlier disease progression and a shorter remission. ZAP70 and CD38 are both newly discovered enzymes found on the surface of CLL cells that are not normally present in B-cell lymphocytes. Studies show that there is a correlation between CLL patients with positive ZAP70 or CD38 expression and the need for earlier treatment, with a shorter progression free survival. Both positive ZAP70 and CD38 expressions have an association with the unmutated IgVH gene and other adverse prognostic factors. ZAP70 is more strongly correlated with the unmutated gene than CD38, which may make it a better marker. Additional studies are necessary to verify the significance of these enzymes and to standardize them as prognostic markers for CLL patients. Time is another factor that cannot be ignored. CLL is an unpredictable disease and often no one knows what will happen until it happens. It is important for patients to know that one good or bad prognostic factor cannot determine the course their individual disease will take. 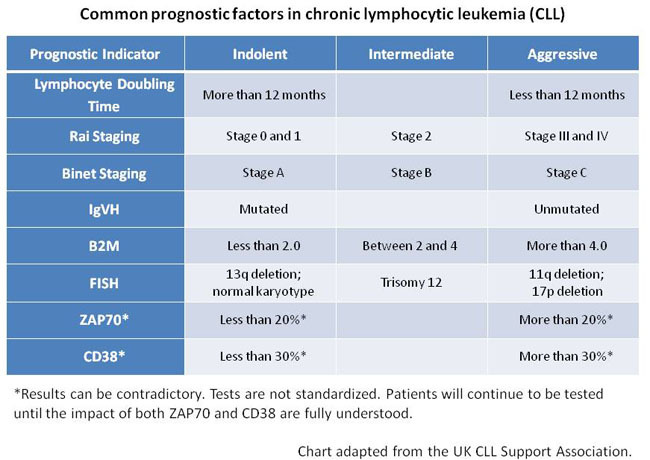 Analyses and statistics do provide some direction, but each CLL case is different and care should be adjusted accordingly. Although researchers have acquired an abundance of information over the last decade, there are still many unanswered questions requiring further exploration. In the process of answering these questions, more prognostic factors will be discovered, providing new paths for treatment options.